Sunday afternoons are the best. For some, its a time when taking a nap is socially acceptable. For others, its a time for spiritual rejuvenation. For a group of 60+ present-minded yoga enthusiasts, this particular Sunday afternoon was a time to give back while stretching out. Big Fish Power Yoga is a power vinyasa yoga studio in Jacksonville Beach that believes in “creating a service – driven culture through developing leaders and building community.” At their core, Big Fish’s team believes in giving back to the community – especially for causes that are near-and-dear to their hearts. Big Fish owner, Mary Lynn, has her own ties to young adult cancer and has supported our mission from day one. 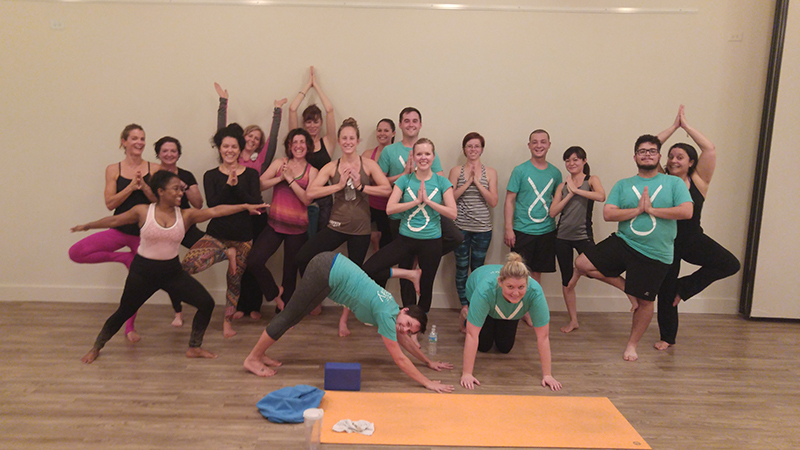 Each quarter of the year, Big Fish Power Yoga, selects a charity to fundraise for through a donation-based yoga class they like to call Practice with Purpose. The premise: yoga goers get to enjoy a discounted yoga class for $5, all of which is donated to the non-profit organization of choice. The Sunday afternoon classes draw a huge crowd and raise quite a lot of money over the course of 12 weeks. More importantly, the classes provide an opportunity for those who attend to learn about local community organizations and their missions. Our students leave empowered, inspired and lit up to take on their life – and they inspire others. Live For Today was fortunate to be the non-profit organization Big Fish chose to support over the last quarter. We have also been fortunate to have developed a partnership with Big Fish to offer our cancer patients and survivors the opportunity to attend yoga classes at no cost to them. When it came time to plan this quarter’s healthy living group event, we knew we wanted to bring together the Big Fish Power Yoga community and our young adult cancer patients and survivors. This Sunday afternoon, that is exactly what we did. Our patients and survivors drove from as far as Orlando to participate in the group class. Before the class, one of founders – and a killer yoga practitioner – Katie, spoke about young adult cancer and why we are so thankful for the support of the Big Fish community. The passion behind our mission became even more clear as the class was introduced to the several young adult cancer patients and survivors in attendance. As the practice began, we quickly realized that ‘power yoga’ means power yoga. Not only was the room heated and closed-in, but the practice encompassed an aerobic and strength-building sequence that was sure to get your blood pumping. Fortunately, as the class neared its end – and my favorite part of the class – it was time for a cold, wet towel and some meditation in savasana (corpse) pose, which essentially entails lying down for a nap. After chanting a few oms and opening our eyes, it was time for a group picture and a refreshing cold-pressed juice thanks to Watts Juicery. All who came left invigorated, inspired and ready to take on the week. After all, isn’t that what Sunday afternoons are for? A big thank you to Big Fish Power Yoga for your incredible support! If you haven’t checked them out, we highly recommend it.